Wailea Sensation Vacation! Spectacular Oceanview Villa! On the 2nd hole. Condo, 2 Bedrooms, 2 Baths, (.Sleeps 4). The tropical splendor surrounding Grand Champion Villas is a paradise. Wailea, near Kihei is where you can play 54 holes of championship golf and sink a birdie while enjoying spectacular ocean views. Service at the famed Wailea's Tennis Club, eleven courts are lit for night play. Breathtaking view of Maui's neighboring island Molokini, Lanai, and Kahoolawe. Parking is directly in front of the unit and is complementary. WE SPEND SIX MONTH IN MAUI, LOVE IT, THAT IS WHY WE MADE THIS INVESTMENT WE PLAY GOLF AND WINDSURF, ENJOY ALL THE BEACHES AND HAVE DEVELOPED A WONDERFUL GROUP OF FRIENDS. LIVE IN COLORADO THE REST OF THE TIME,ALSO SPEND SOME TIME IN MX WITH OUR SIX CHILDREN AND 14 GRANDCHILDREN.WE ARE BOTH RETIRED. BEFORE WE RETIRED RON OWNS A SAUSAGE CO. WHICH ONE OF OUR SONS RUNS NOW, AND I SOLD REALESTATE STARTING IN 1968, I STILL HAVE MY BROKERS LICENSE IN CA. AND CO.I REALLY ENJOY TAKING CARE OF THE RENTALS . TRY TO MAKE THEM SPECIAL. I LOVE IT WHEN WE HAVE RETURN GUEST AND WE DO HAVE MANY OF THE SAME GUEST THAT HAVE BEEN COMING BACK FOR 5 OR MORE YEARS.WE HAVE WALKED THE PATH AND OTHER AREAS ALL OVER WAILEA .ENJOY ALL THE GREAT RESTRURANTS,THE WHALE WATCHING IS UNBELIEVABLE. ALL OF OUR CHILDREN HAVE BEEN HERE AND LOVE TH EASY ACCESS TO THE POOL AND BAR B Q. WE ARE RIGHT NEXT TO THE QUIET POOL. ALWAYS FUN TO WATCH THE GOLFER GO BY.JUST RELAX ON THE LANAI AND WATCH THE SUNSET. BEAUTIFUL SUNSETS AND GOLF COURSE 7TH HOLE. THERE ARE TWO POOLS THE ONE NEXT TO THE CONDO IS THE QUIET ONE ALSO HAS A SPA AND THE BAR B Q AREA. We had a great stay! Beautiful view of the golf course and ocean. 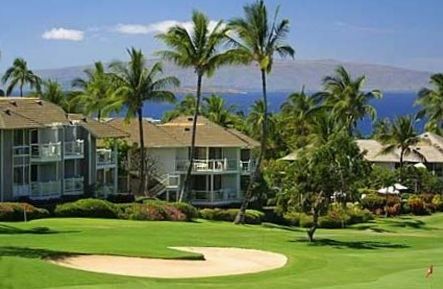 On the Wailea golf course, nice property at a good price. Clean, comfortable and stocked for a vacation with beach chairs, umbrellas, and boogie boards. We stayed here at the end of Feb. The location was fabulous, just across from the Grand Wailea. There are quite a few beach access points, close to the resorts. Our fav was the one near Andaz. Away from the hustle and bustle of Kihei, but still walking distance to a small grocery store, and a couple of mins drive away from the larger stores in Kihei. The condo was also nicely stocked with stuff to go to the beach with, lots of beach towels. There are 2 pools in the complex also. Tracie the owner was also super nice. Definitely would stay again. Worked very well for us. The location was perfect for us. The unit was well equipped and larger than we expected. It took a few days before we realized the washer/dryer was on the patio. It was nice to wash sandy towels. We really appreciated the beach chairs and umbrella. That was a really nice surprise. The owner forgot to register us with the office and get us a parking pass. This wasn't a problem though because the office staff took care of it. I would recommend this property. I’m happy you had a great time. I just wanted to let you know I did advise Grand Champion of your arrival. I received an email from them about that. And in turn I sent my original email showing that I had advised them of you arrive. And they apologize to me for that. Once again Thank you. Our stay at the Grand Champions resort was wonderful. The unit we rented (unit 66) met all of our needs, spacious, comfortable beds, quiet and very close to the pool. The view from the lanai overlooked the golf course and had beautiful a view of the ocean and sunset. We had one of the AC unit fail but it was taken care of immediately. It was an exceptional hot/humid Sept/Oct. We would definitely rent this unit again. I loved staying in this 2 bed 2 bath condo! I would definitely stay here in the future. This unit is close to many beaches: Wailea, Kamaole 1, 2 & 3 and many more! You have an amazing view of the pool, golf course and lastly you can witness amazing sunsets from the Lanai! The square footage of this condo is perfect for a family of four! The master bedroom has a comfortable king size bed, amazing view out the window and a very large shower with 2 shower heads. Reading previous reviews they mention the AC units were old, but it did its job and kept the apartment nice and cool. In the second bedroom there are 2 twin size beds with 4 inch memory foam so comfortable you would not want to get out of bed! This room also has a full size bathroom. If you want to save money, utilize the kitchen! Make your meals at home and eat out on the lanai and enjoy the beautiful view this condo has to offer! The living room has comfortable sectional couch. Being that we were on vacation, we did not turn on the TV because there was just so much you can do in Maui! But when its time to wind-down, you can just relax on the couch. New washer/dryer was a plus! Thank you, Tracie for letting us stay in your condo! This made our 10 night stay memorable and worth it! Price is not guaranteed until payment is received.